Super Retina. Welcome to the big screen. Custom-built OLED. The OLED panels in iPhone XS Max allow for an HDR display with the industry’s best color accuracy, true blacks, and remarkable brightness and contrast. They’re the sharpest displays, with the highest pixel density, on any Apple device. HDR10 and wider stereo sound. With support for Dolby Vision and HDR10 titles from iTunes, movie night comes to iPhone. Wider stereo playback makes it all sound great. And your HDR photos — even those you captured before — will have a 60 percent greater dynamic range. Do more with a glance. 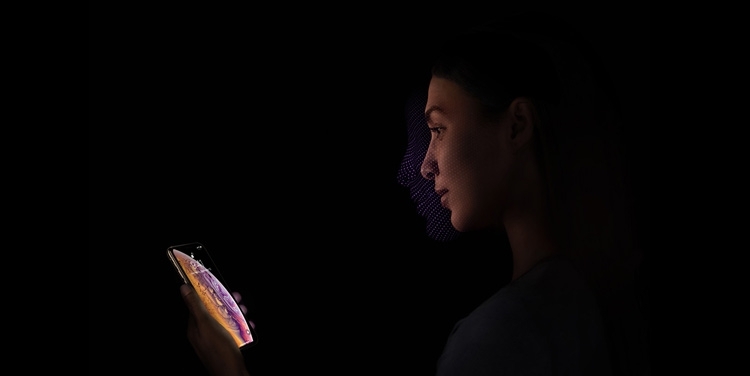 Face ID does so much more than unlock your iPhone. So you can forget about typing user names and passwords. Now all it takes is a look. A whole new level of intelligence: The A12 Bionic, with our next-generation Neural Engine, delivers incredible performance. It uses real-time machine learning to transform the way you experience photos, gaming, augmented reality, and more. Apple-designed CPU. Two performance cores tackle heavy computational tasks. And four efficiency cores take on everyday tasks. Our newest performance controller dynamically divides work across these cores, harnessing all six when a power boost is needed. Apple-designed GPU. A new fourth core and lossless memory compression bring big gains in graphics performance to games, video editing, and visually demanding apps. Dual-camera system. Say hello to a new era of photography. 4K video and wider stereo playback. iPhone XS Max shoots the highest‑quality video of any smartphone. With better low-light performance. Extended dynamic range in videos up to 30 fps. Stereo recording. And stereo playback with wider sound separation. A new level of water resistance. The most durable glass in a smartphone, sealed and precision-fitted with the surgical-grade stainless steel band, helps create a more water-resistant enclosure — up to 2 meters for 30 minutes. iPhone XS Max even resists spills from coffee, tea, soda, and more. Wireless charging. The glass back allows iPhone XS Max to charge wirelessly. And it charges even faster than iPhone X. Video: Yes, [email protected]/30/60fps, [email protected]/60/120/240fps, HDR, stereo sound rec.